Front cover of the new title from Burleigh Dodds Science Publishing. 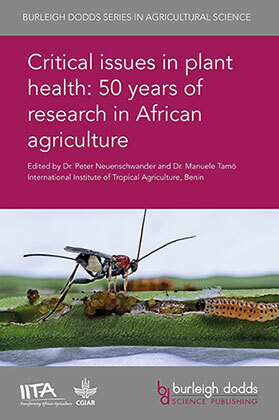 The recently published book by Burleigh Dodds Science Publishing, ‘Critical issues in plant health: 50 years of research in African agriculture’ is a collection summarizing 50 years of research on plant health by IITA to improve the health of crops in Africa. It is part of the rapidly expanding Burleigh Dodds Series in Agricultural Science, which provides standard references in various frontiers of agricultural research and cultivation. In addition to delivering knowledge for the global scientific community, Burleigh Dodds makes specific contributions to IITA’s research as a publishing partner as well as a resource provider. Continuing this trend, Burleigh Dodds announced a 20% discount offer to IITA on all the books in their catalogue. With over 50 published titles and an extensive forward program, the Burleigh Dodds catalogue covers the major crops and livestock types. To redeem the discount, use discount code IITA20.